I have been thinking to post this recipe since few days but conveniently forgot about this until I came across 'The Potluck-Chicken' event hosted by Vicky. And if you have read one of my earlier posts on Kerala chicken curry you will be knowing how crazy I'm about chicken dishes! I'm happy to indulge on it at any time of the day and due to my cravings for chicken I was the obvious target of my friends who loved to tease me on this craziness of mine. So here is another one of my favourites-Kerala style Chicken Roast. I adopted the recipe from my husband's Kerala Beef Roast recipe which I had posted days ago but changed the quantity of ingredients used to suit the preparation. My husband is crazy about whole fresh spices and try to include them in any dish which doesn't even call for one. Though I use whole spices in some preparations, pairing with him turned me to a spice addict too and since then I have been generous in the usage of whole spices! I love the flavour imparted by freshly roasted and ground spices especially in meat preparations much to the delight of my husband who revels in his achievement of transforming me into a spice addict! Dry roast the spices mentioned above at about medium heat in a pan until it starts to change colour or you get the aroma of the spices. Cool and grind to a powder without adding water. Keep aside. Marinate the chicken with the ingredients mentioned under marinade. Keep the marinated chicken for 3 hours in the refrigerator. Cook the marinated chicken in a pressure cooker. There is no need to add water to pressure cook chicken but in case you are concerned about safety(as I am!) you may add little water. Keep cooked chicken aside. Heat 1 tbsp coconut oil in a pan and splutter mustard seeds. Add curry leaves and saute for few seconds until it turns crisp and gives out aroma. Add minced ginger and garlic and saute till raw smell goes. Add chopped onions(or shallots) and green chillies and saute till onions turn brown. Add the remaining 0.5 tbsp freshly ground spices and saute for few seconds more. Add turmeric powder, coriander powder, chicken masala and salt and saute for few minutes until raw smell of the spices go. Add cooked chicken along with water left after pressure cooking and mix well. Cook on medium-high heat until the dish turns dry. This process may take about 30 minutes depending on the amount of liquid and the heat. Note that during this process you need to stir continuously to prevent it from sticking to the bottom of the pan. Add 1 tsp coconut oil and mix well. When the dish has become dry and has turned brown remove from heat. Serve hot with Appam/ Rice/ Roti/Chapati/ Naan. This goes to The Potluck-Chicken event hosted by Vicky of Viki's Kitchen. I think this looks delicious!i followed you through the foodie blog roll and I love the recipes you have here!Hope you wont mind but I'd love to bring over our Foodista readers to your site, just add this little widget here to this post and it's all set to go, Thanks! Thanks DB, yes you are right..thats another option! Oops I had forgotten this option!! Will include this too. Thanks Ms.Sailaja :) Yes I guess kids would favour dry dishes than gravy ones! Wow nice recipe dear.I will try this recipe. Wow Pooja, am just drooling over those yummy roast..wat a amazing dish, very new to me! I want some now!!! God-it's been ages since I ate this dish-my friends mom used to make this whenever I went to their place in Chengannur!! I just had this at a potluck last week. Nice recipe. Vineela, do try and let me know your verdict too. 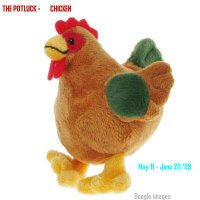 I love chickem too... Certainly a different recipe... Looks great! I was seriously wishig I could have some after the dinner I am still craving for food now!!! Thanks Ramya..hehe what if I pass the dish to you? I bet this was so aromatic it looks gorgeous and the golden brown colour looks so very appetizing YUM! I love adding lot's of spices in a dish. This one turns out beautiful. Your house must smell so nice. Thanks Helene :) Yes the house had aroma of fresh spices! Kerala style dry roasted chicken is my all time favorite. Thanks for revealing the secrets and sending it for the event. Looks wonderful and fantastic. Mouth watering. Yummyyyyy.... one.